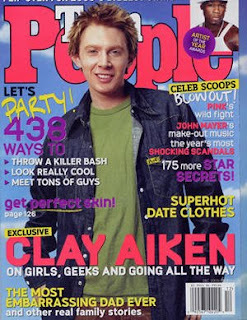 Did Clay Aiken kill these magazines? Kids these days. Six magazine titles with more than 400,000 circulation bit the dust in the tail end of 2007, meaning they either stopped publishing or having their circs audited (which means hey, they were really, really embarrassed by the reader count). The newly deceased included Child, Jane, Junior Scholastic, Nick Jr., Success, and Teen People. Hmm. Seems like most targeted young people. Not a good trend for mags, given that people tend to take their media habits with them as they age. Maghound: 7 Lindsays in your mailbox for the price of, um, 7? Magazines aren’t dying like newsprint, which has circulation numbers off the cliff, but mag circs are down as well — about 11% since their peak in 2000. Reading on glossy paper is fast becoming a habit of senior citizens; the top 5 U.S. magazine titles include the AARP bulletin, Modern Maturity, Reader’s Digest, TV Guide (seniors remain the heaviest consumers of TV), and National Geographic. Which is why we dig Time Inc.’s new Maghound.com, a Netflix-like subscription service where for a set fee each month you get access to as many rotating magazine titles as you like. The service will launch in September with 300 titles. $9.95 a month nets you access to seven titles at the same time, which you can mix and match or cancel without annual commitments. And yes, the magazines arrive in the mail on real glossy paper. The model behind Maghound is still nascent and a bit unpredictable. Will this boost demand for in-the-mail pubs? Or will readers quickly switch gears, creating no net gains? Or will readers, seeking savings, shift from traditional mag subscriptions to the seven pubs for $10/mo model, cannibalizing existing subscriptions? Or will readers say, hey, I can find most of this online for free now anyway? If the past trends of emerging media are any clue, we vote cannibalization. No matter. We’re signing up as fast as we can. Internet hooey aside, nothing beats a well-edited glossy magazine in the hands for an enjoyable hour of reading before bedtime. We’re getting older, and these backlit screens hurt the eyes.